This Saint was from the city of Bythlaba and was of noble birth; he was the closest and most honoured friend of Isdiger (or Yazdegerd) I, King of Persia (reigned 399-420). Though a Christian from his youth, James renounced Christ because he was allured by the King's friendship and flatteries. When his mother and his wife learned of this, they declared to him by letter that they would have nothing more to do with him, since he had preferred a glory that is temporal to the love of Christ. Wounded in soul by these words and coming to himself, the Saint wept over his error, and repudiated the worship of the idols. Therefore, becoming exceedingly wroth, the King - this was Bahram (or Varahran) V (reigned 421-438), Isdiger's son and successor - condemned him to a most bitter death, the likes of which not even a brute beast was ever condemned to: that is, his body was dismembered at every joint of his arms and legs. And so, when he had been cut asunder limb by limb to his very hips and shoulders, the courageous Martyr was finally beheaded, in the year 421. O stout-hearted James, persuaded by thy noble wife, and fearing the dread tribunal, thou didst scorn all fear of the Persians with their profane decrees, and thou wast shown forth to be a most wondrous martyr of Christ, when all of thy body was pruned like a vine. 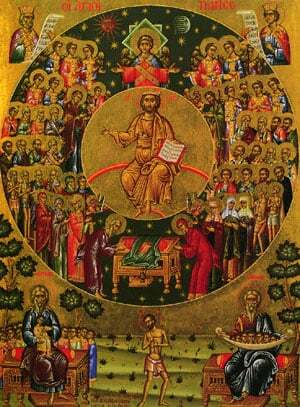 Share the feast of James the Great Martyr of Persia with an icon greeting ecard.